Well 2014 has come to an end so let's stuff in one last news update with things I became aware of over the holiday break. First up in another case of "thank god I got out there" NS did indeed replace the classic and easily accessible N&W CPLs at Shenandoah Junction. The opposite end of the siding had seen a new interlocking installed in a lengthening project, but for a while it seemed as if the Junction would be safe. Well no dice and another railfan hot spot bites the dust. Thank God I got out there for a full survey in March 2014. The new Shenandoah Junction has been moved slightly to exclude the grade crossing from interlocking limits. The Indiana and Ohio regional line has been a bastion of old PRR PL signaling when the Class 1's have been ripping out everything under the sun. Well if one assumes that such lines do indeed lack the money for new signals you are correct. 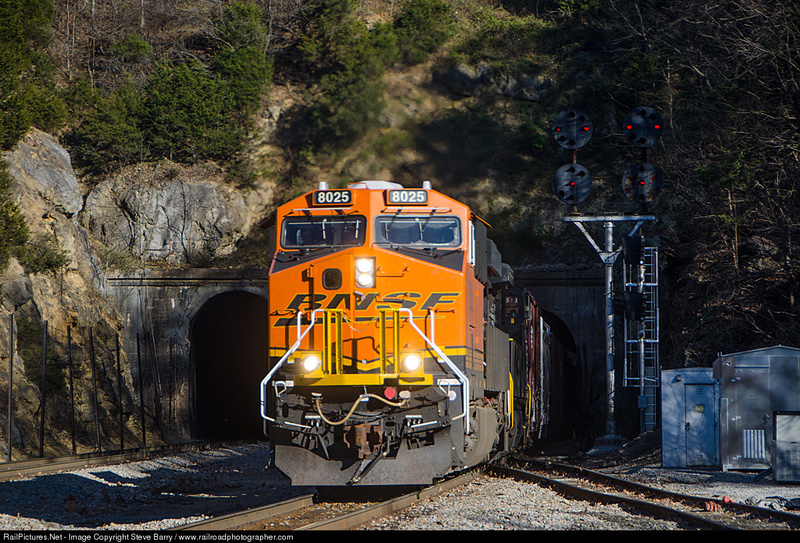 However they also lack the money for any signals what so ever and apparently the I&O is abandoning its CTC signaling in 2015. Click the image for more info. Sticking with NS it appears that their Southern re-signaling project has reached Atlanta. Why would you give Southern caltilevers OSHA upgrades if you are just going to scrap it? Keeping with the theme of railroad wastefulness, we return to Kennesaw, Georgia where new Darth Vaders have replaced some SCL elephant ears on a modern type cantilever. The signaling has not been completely cut over as the new heads are still turned. Would it really have been harder to retrofit the old hardware? Anyway, that's it for now. Sorry to end 2014 on a down note, but I'm expecting more bad news in 2015 as well. Oh well, Happy New Year! 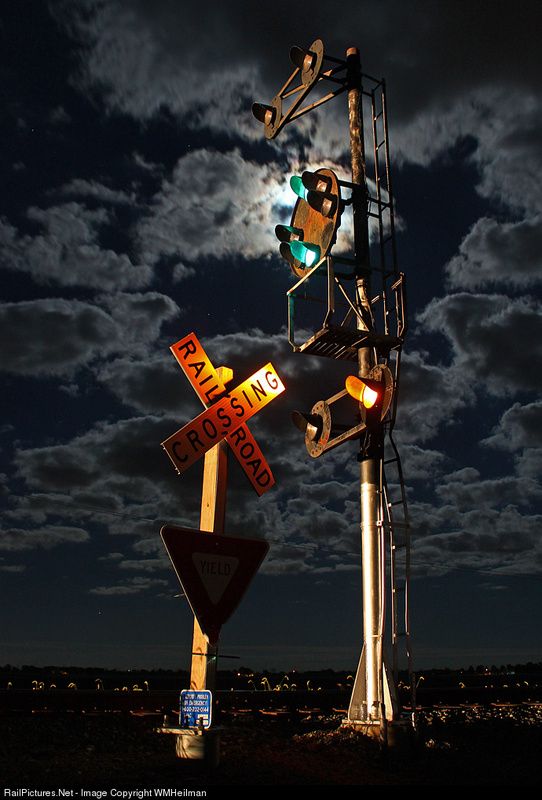 Over the years I have come across many interesting terms and expressions related to railroad signaling and railroad signaling control and I thought it might be nice to share a few of them with all of you. Now of course the North American rail scene is large and varied so many of these terms might only see use only in certain areas or with certain railroads. The PRR is one such road with a lot of its own unique terminology and since I spent a lot of time in PRR towers more than a few of the terms will come from there, however this isn't to say that other terms of either incorrect are aren't used elsewhere. Hanger - This an alternate term of a Call On signal on the PRR. The Call On condition would be represented by either a Restricting \ on the lower head or a single Stop and Proceed marker below the main head. In both cases the displayed signal appeared to hang below the --- on the upper head. The Goat - The "Assistant to the Train Director" was known as "The Goat" in those PRR towers large enough to have that position. Note that an Assistant to the Train Director was not the same as an "Assistant Train Director". I found this time in a 1948 book on PRR operations and later heard an Amtrak operator mention that the third man in ZOO tower who was in charge of all NEC movements (before those parts of ZOO were spun off ~1999) was called "The Goat", but he didn't know why. Well now you do. 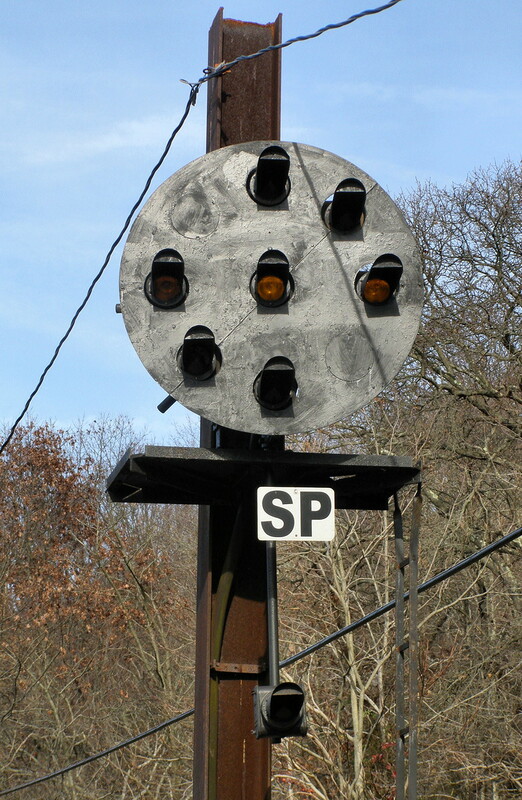 Pot - PRR position light dwarf signal. On the Light - A train is inside the approach block as shown on the tower model board. In PRR cab signal territory most interlockings had approach locking which required time to be run only when a train was actually approaching the interlocking. Stick and Non-Stick Signals - These are alternate terms of controlled and semi-automatic signals. "Stick" signals were those which would drop and stay at Stop after a train movement and stay that way even if the lever was not reversed. Non-Stick, aka "semi-automatic" signals would have the signal act automatically as long as the lever was left reversed. I have encountered this term a few places, but it was standard in New Haven railroad operations. Stacking - A feature of modern CTC dispatch systems that allow dispatchers to queue up routes at interlockings in an ad-hoc fashion. Double Barreling - Running two parallel movements in the same direction on a double track main line. Giving 241 - Reference to NORAC Rule 241 for giving permission past a stop signal. Paperwork - Train orders, track authority and mandatory directives of all types that have to be copied down or received on paper. Dark Territory - Anything that doesn't show up on the dispatchers screen, signaled or otherwise. The Railroad - A point running from one controlled signal to the next. is "given" to the engineer when it is time to get to work. That's all I can think of right now. I might occasionally return to this post to add more. Feel free to make your own suggestions in the comments. Built during the roaring 20's, LAKE ST exhibited all the opulence of the era with a tile roof, copper gutters and all brick construction. During the Amtrak era is was actually upgraded with modern picture windows and ample exterior lighting. LAKE ST was closed in 2005 after 80 years of service and then demolished in 2013 due to an overbuild project to cover the tracks with either condos or a park. Until then it was a fixture of the north side railfan scene, viewable from the adjacent Lake Street bridge and easy to work into all sorts of photo angles. This may seem like the typical story of a classic big city tower, but LAKE ST was something special and one tip off is the windows. Like many Chicago area towers, LAKE ST was equipped with an emergency exit. The south side of Chicago Union Station is far more complex and sees far more traffic. With road bridges providing an unobstructed view of the action it is what people think of when they think about long distance passenger rail in Chicago. That part of Chicago Union Station was controlled by HARRISON ST tower, an elevated affair that was eventually surrounded by the new post office building in the mid-1990s. 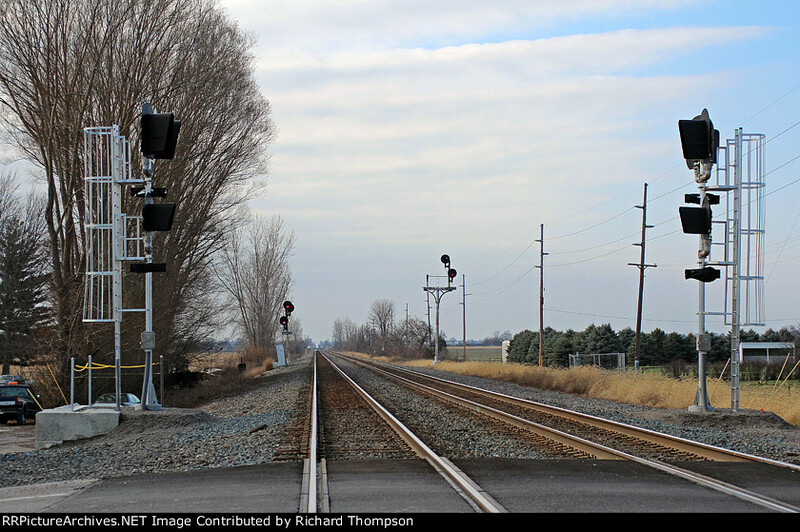 At the time Amtrak also embarked on a large scale re-signaling project on the south side replacing the old Model 14 machine in Harrison Street with modern relay logic and the PRR position light signals with B&O style CPL dwarfs and high color lights. What main people failed to realize was that the north side interlocking controlled by LAKE ST was left completely untouched and moreover, control of the south side plant was moved to a large NX panel in LAKE ST tower. 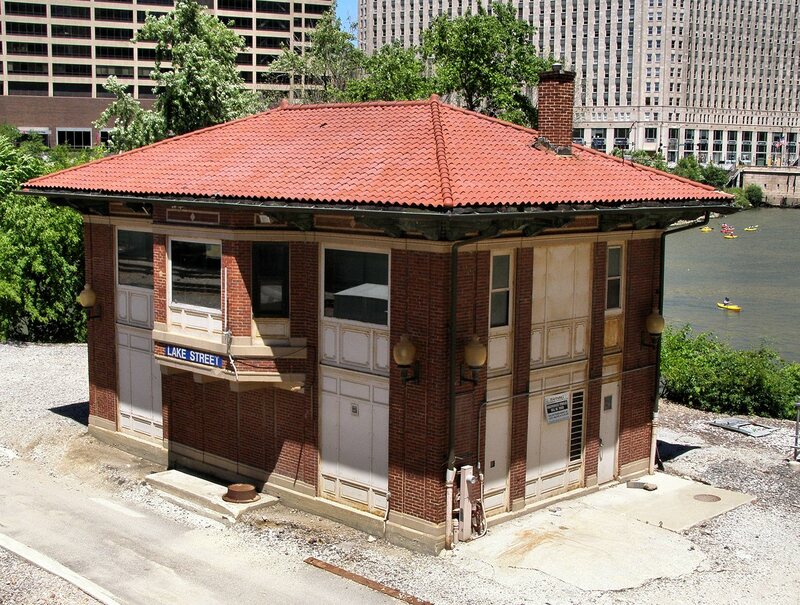 Thus LAKE ST wasn't just a tower, but was the control facility for the entire Chicago Union Station complex. Thus, nice new lighting and big picture windows. In 2005 time finally caught up with LAKE ST as a $45 million, 2-year project to re-signal the north end finally came to fruition. This saw the replacement of the PRR PL dwarfs with LED searchlights, the implementation of a new CANAL ST interlocking to replace what had been a number of hand throw crossovers north of LAKE ST interlocking proper and the consolidation of all Chicago signaling control into the CUS office complex. This included the closure of Amtrak's 21ST interlocking at the southern gateway to the CUS complex as well. The interior photos I have of LAKE ST were taken just before and then a few years after its closure. Here we see a post closure photo the 95-lever US&S Model 14 interlocking machine originally installed in 1925. The large number of white painted spare" levers is due to the rolling closure where successive parts of the interlocking plans were cut into the new vital logic. 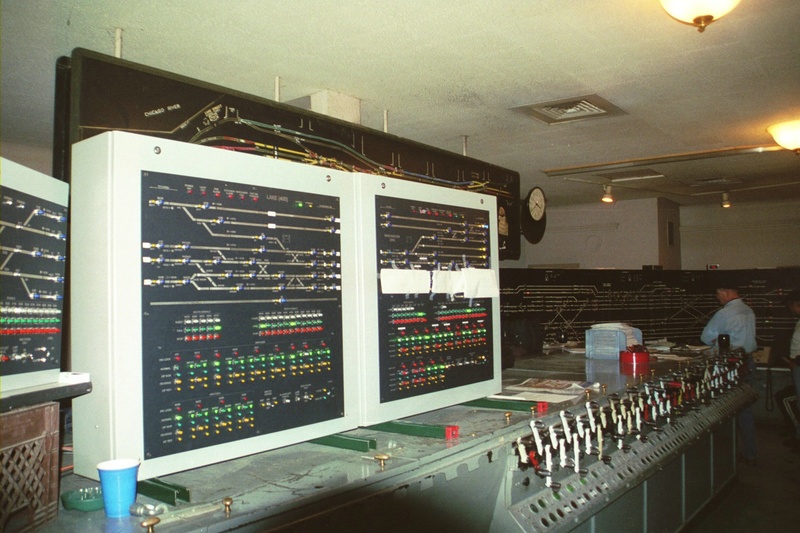 At the time of its closure the LAKE ST Model 14 was down to 9 signal levers, 4 switch levers and one traffic lever. 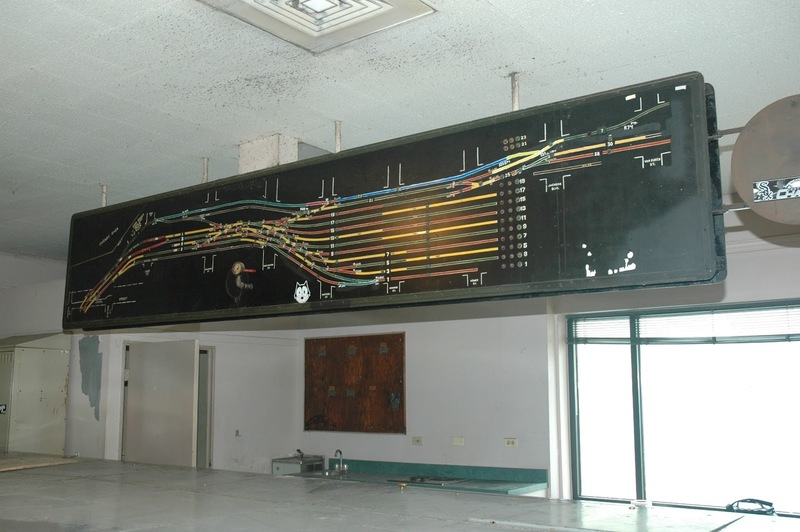 The model board shows the layout as it originally was with 11 station tracks that fanned out from a three track main line. 9 of the tracks are stub end with 2 additional through station tracks and 1 bypass track. Station tracks are given odd numbers as even numbered tracks are on the south side of the station. 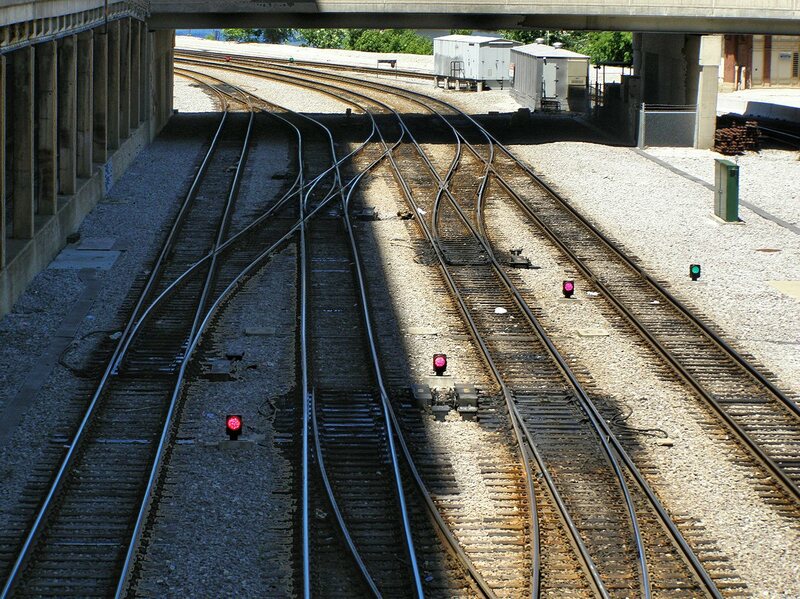 The model board is 4-colored in accordance with Milwaukee Road practice and uses green lamps for track occupancy. Displayed signals are not shown on the model board. Alterations have been made with a combination of black tape and hand painted lines. On the through tracks a number of signals that are controlled from the NX panel are indicated with the N/S suffix opposed to L/R. A quick count indicates 7 doubleslip switches, 11 single turnouts and 5 crossovers. In this opposite view of the model board we can see the entrance to the interlocking at the grade crossing with Canal St. Most of LAKE ST interlocking is located underground a block or two north of the tower itself. The tower only had direct sight of a few hand throw crossovers near Canal St and the outer crossovers between Lake St and Randolph St. One of the reasons for the rolling cutover was because the interlocking was not only resignaled, but also reconfigured. Compare the model board above with a facing point ladder track, stub end track 5 and a non-circuited track passing close to the tower to the current layout below. 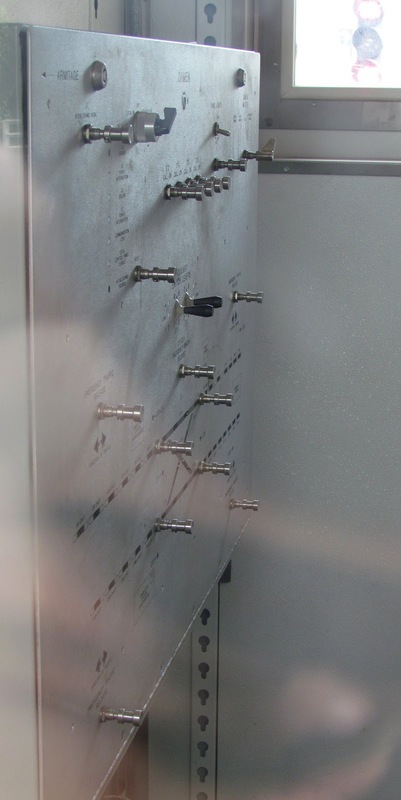 Here we see a parallel trailing point ladders, one of which employs a doubleslip, the other a scissors crossover between the two center tracks. 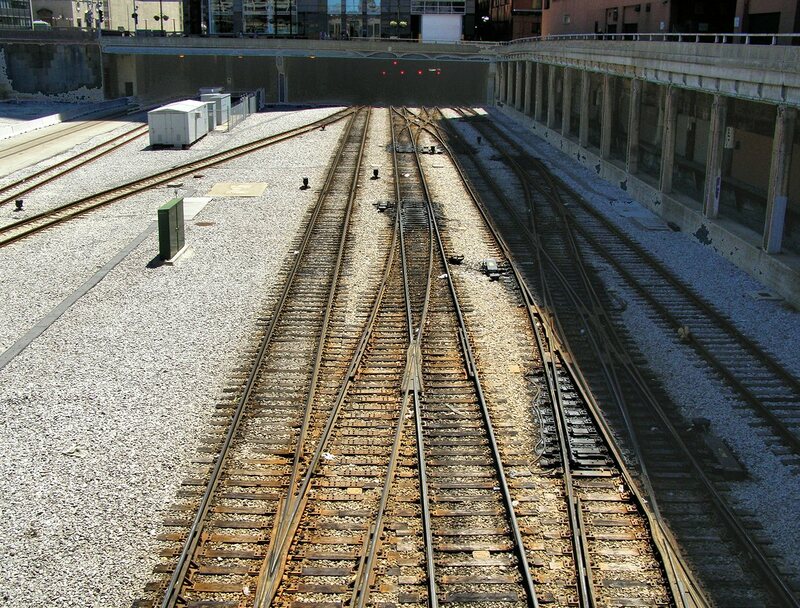 The non-circuited track has been removed leaving the single station bypass track.For a more complete view of the current interlocking layout please refer to this computerized model board of the Chicago Union Station area. Back inside the tower we see an odd blank patch on the interlocking machine where lever spaces 1 through 32 had been removed. This does not appear to have been part of the re-signaling effort given the age and condition of the metal. Looking at the model board I suspect there was some spare capacity at the lower end of the machine in addition to some of the northern part of the plant being made redundant through hand operated switches. Without lever positions on the frame I am unsure how the 16L, 18L, 20L, 24R, 26R and 28R holdout signals at Canal street were controlled. Closeup view of the levers looking down the frame towards the emergency exit door. The bay window is to the left of the photo. Last active lever is 94, but the frame has space for 95. Another view of the levers this time showing the mix of 1920's and modern track lighting fixtures. Moving back in time to 2004 we see the tower towards the end of the re-signaling project. The Model 14 machine is still in service, but most functions have been transferred to a pair of NX panels sitting over the blank section of the frame. The remaining part of the interlocking still controlled by the Model 14 is covered over on the panels. A really great way to make your photos look awesome is to go out at night and set up a long duration exposure. 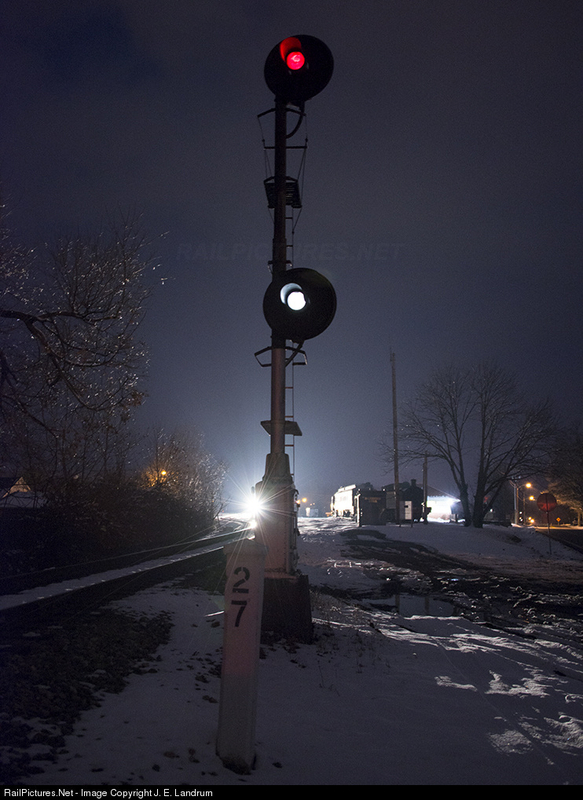 It might be a little more complex than that, but not much and night shots have always been some of my favorite instances of railroad photography. 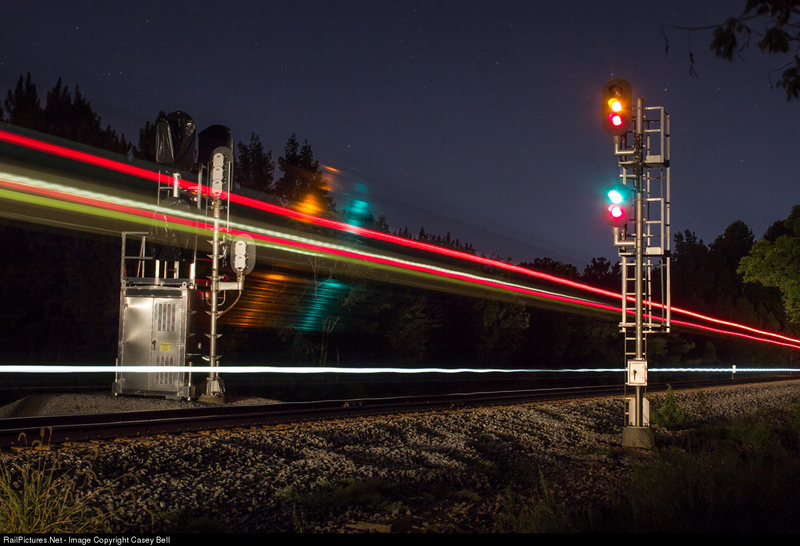 Another thing night photography excels at is capturing railroad signaling and for today's installment of Caught on Camera, I have come across a few examples that have managed to capture some interesting signaling phenomia. In our first example we have Amtrak's Crescent knocking down an Approach Diverging indication on a Southern style intermediate signal on the former Southern Main Line. The signal in question is a quasi-modern replacement for the less modern signal facing the opposite direction. The older signal exhibits the offset head style that was once popular to denote automatics before number plates became standard. The camera shutter was left open long enough to capture the signal dropping from Y/G to R/R. 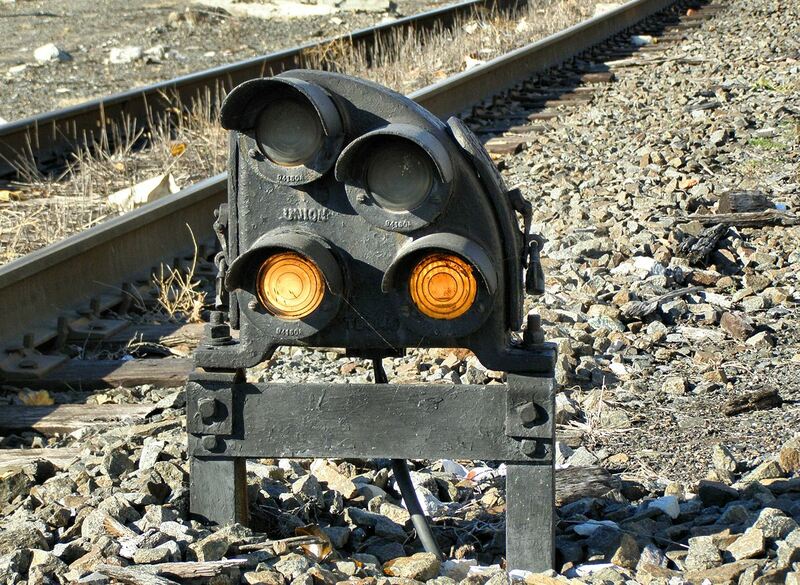 Here we see an example of a "Bottom Yellow" style searchlight signal displaying a route into non-signaled trackage. Bottom Yellow restricting displays a R/R/Y indication while omitting the middle red marker to save on costs. 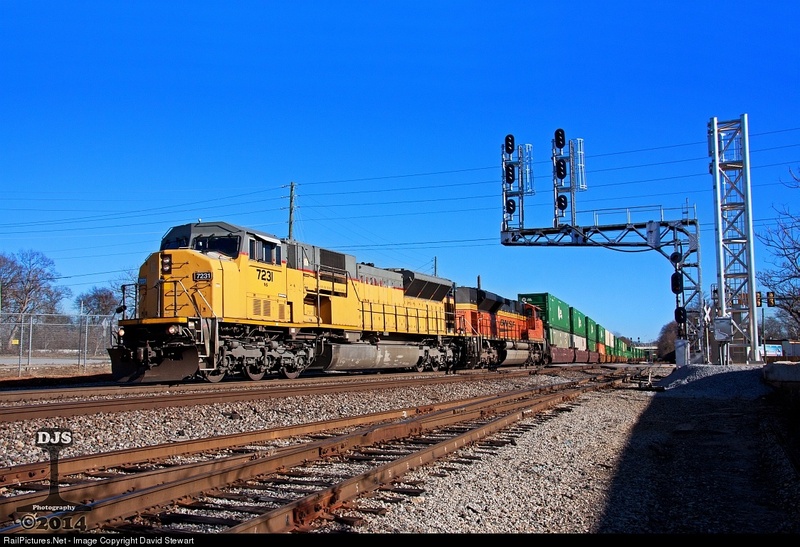 As you can see this Bottom Yellow aspect has been modified by CSX to use Seaboard style indications with lunar white in place of yellow, creating a bit of an anachronism in the process. 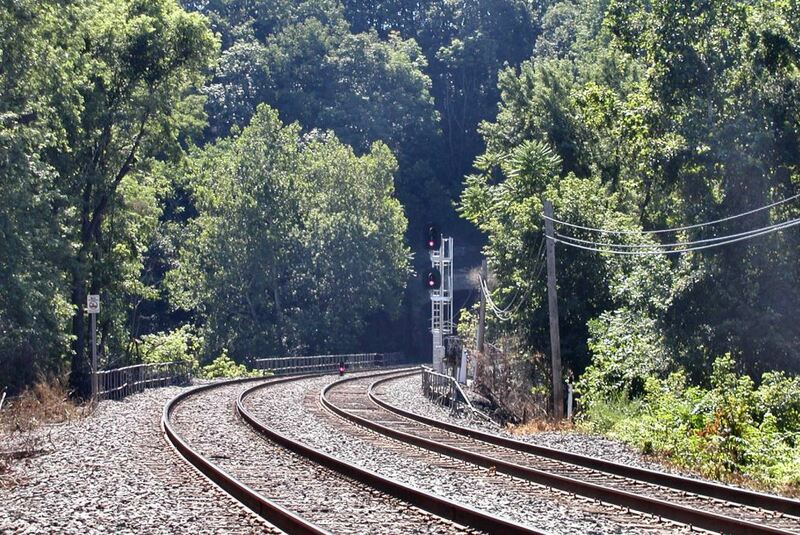 N&W CPLs are spectacular at any time of day, however this pair of automatic bracket signals in West Virginia is demonstrating a feature of some CTC systems (typically GRS Traffic Control System brand CTC) to allow blocks to "float" if no route was signaled into them. This resulted in indications better than Stop and Proceed being displayed in both directions. The alternative to this setup would be to have a "traffic lever" that would need to be "thrown" to set the flow of traffic. Note that the reverse signals are both at Approach and have lower heads confirming that the next signal down the line is an interlocking. While the old D&H searchlights at the north end of the Saratoga Springs station have been replaced by LED Darth Vaders, it is still possible to see them in a good light. 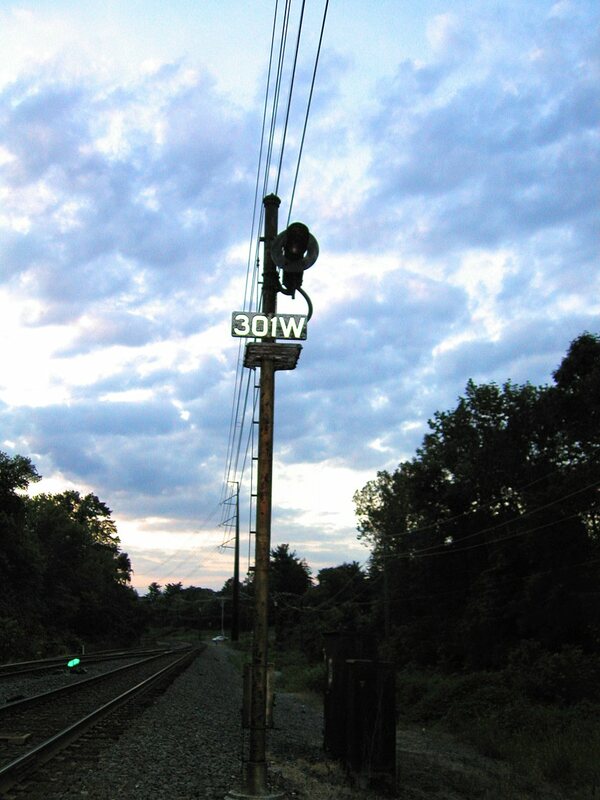 Here the siding track mast displays a Medium Approach onto the main at CPC-37 in all likelihood for a movement onto the unsignaled North Creek branch at CPC-38. 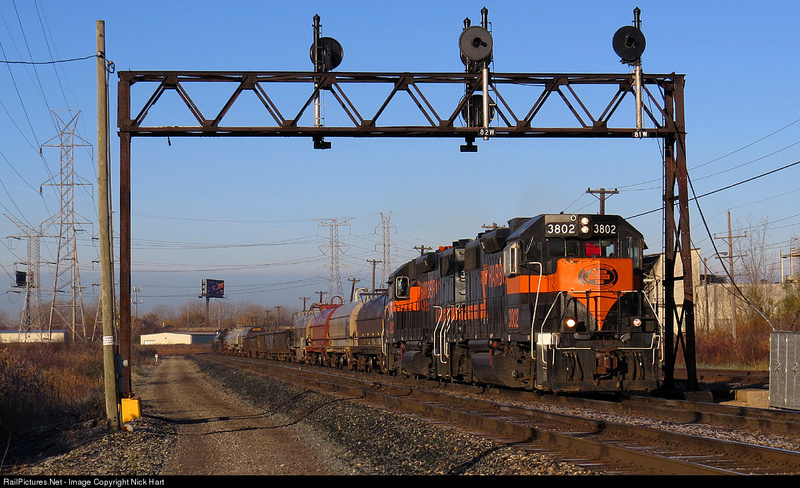 The presends of single lamp lower heads indicates that unlike CSX, Canadian Pacific has chosen not to spend the extra money to upgrade the CTC to support Restricting indications into long sections of single track. I'm sure some might argue that flashing green | Slow Clear might be rarer since few locations were given that upgrade, but that's not really one of the original set so I don't tend to count that. Well I just got back from a trip to Chicago on which I captured video from a METRA express run inbound from Aurora. This gives me the opportunity to report back on the status of the surviving Burlington searchlights as well as other news. As with most "news" segments this one is pretty bleak as all signaling marches towards a sterile and uniform future where the only bright spot is the new standard 20 year service life because propritary microprocessors are sooooo much better than those standardized relays that could last 3-4 times as long. 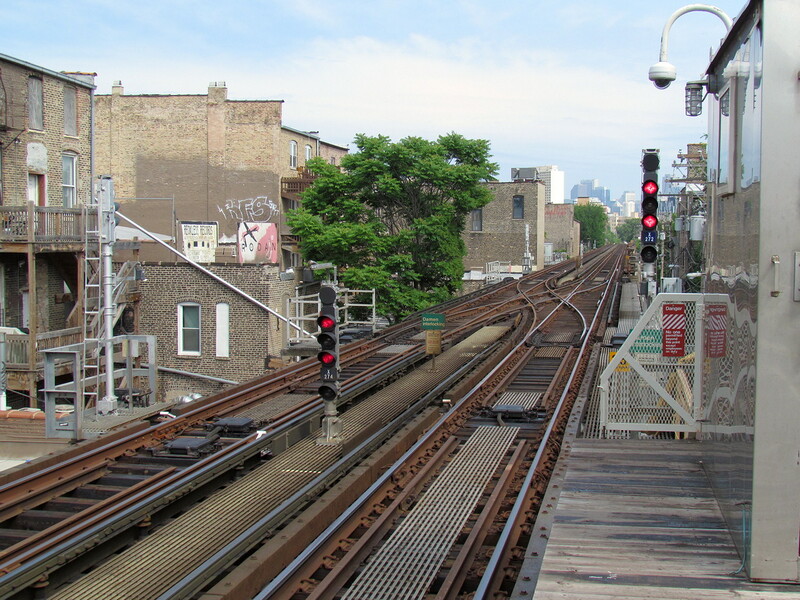 We begin on the Chicago Line near MP 324 where NS is replacing some NYC/Conrail era intermediates with new Darth masts. 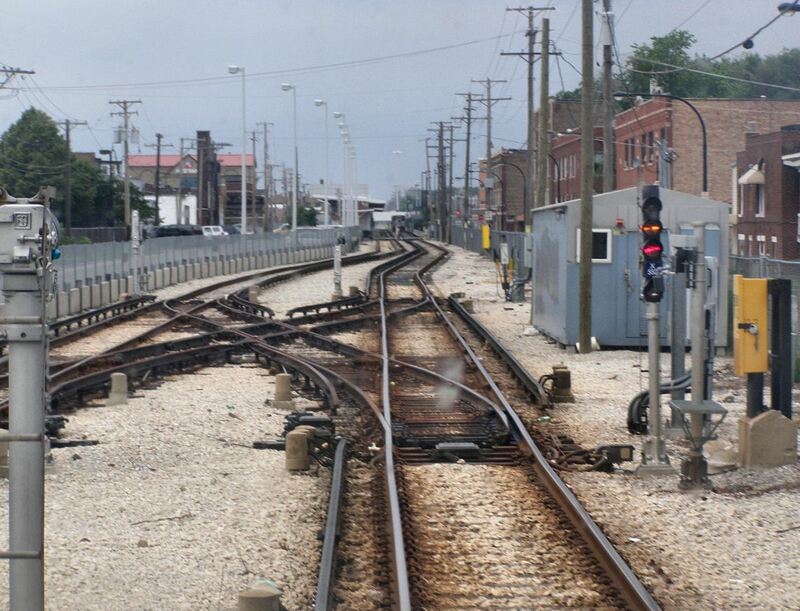 This part of the Chicago Line was original signaled 261 under the Central with bi-di bracket masts. Later after the "right side" rule was lifted, Conrail un-bracketed the brackets as part of a doublestack clearance project. In another NS related blow to signaling the famous N&W bracket mast at the mouth of the Montgomery Tunnel are being replaced. These were hooked to new signaling logic in the 80's or 90's and should have been safe for another decade or two. 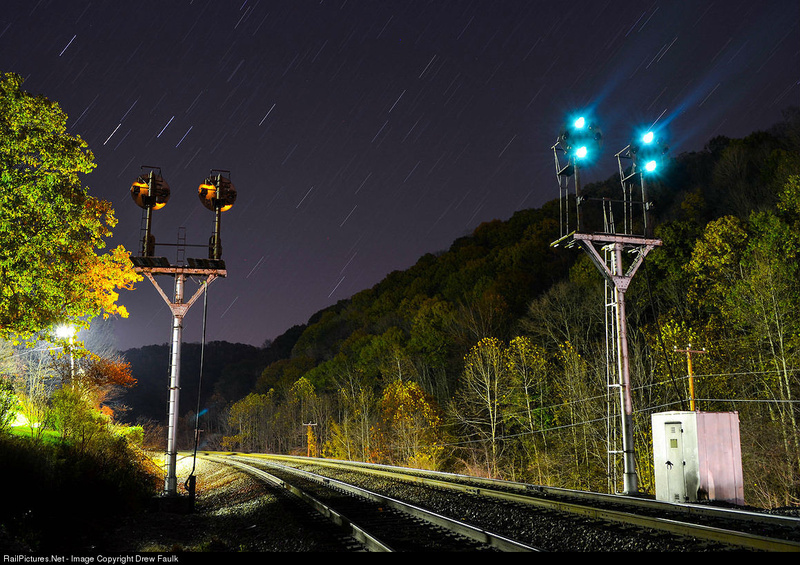 With the Thurmond signals now history there aren't many good photo locations left in the Appalachians. 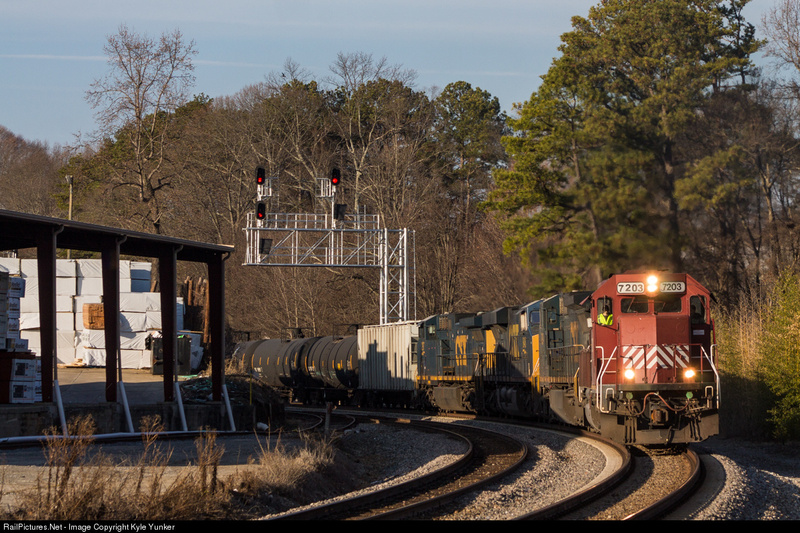 The NS Southern main line resignaling project has had the new signals cut in as far as Toccoa, GA. In a small bit of good news some NYC-era IHB signals on a signal bridge in Calumet City have gotten a fresh coat of paint. These are of an older "long" style GRS style searchlight that NS is currently removing on some of its lines in Tennessee. I also paid a visit to DOLTON junction which last had part of its western end turned into the new CP-107. Anyway the remainder of the core interlocking plant with its mechanical lever frame logic is still not showing signs of full replacement. Some additional bad news however is that the signals on the new CP-107 and CP-112 gantries have 4-lamp heads with Seaboard style Lunar. 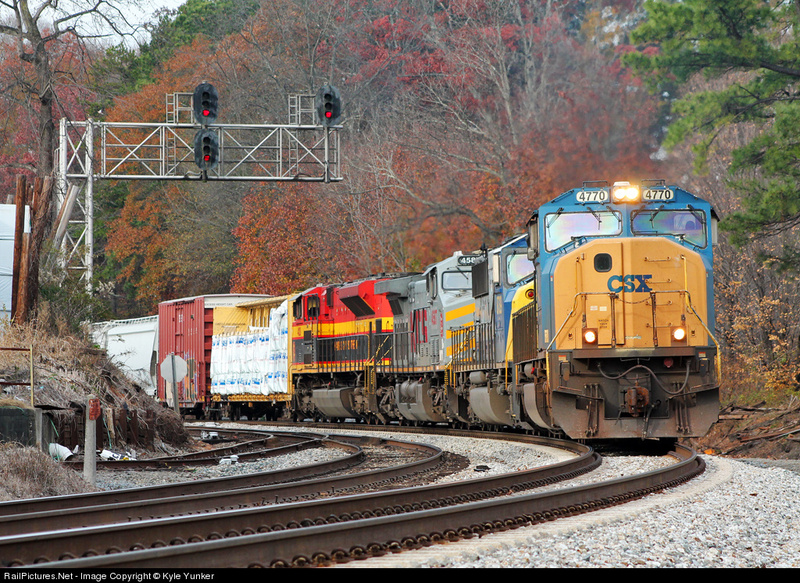 Bad omens of a CSX future or change to western style route signaling? Onto the Aurora Line (aka BNSF Chicago Sub). The searchlit interlockings around Eola yard are showing signs of work, but it is progressing slowly, now entering their second year. Many of the signal appliances have yet to be installed so it is still good for photos. The truly depressing news is that the massive UNION AVE interlocking plant adjacent to the Chicago Union Station wye is now on track to be re-signaled as well. This was a 1990's replacement of a GRS machine in a tower and was one of the last new instals of Burlington style searchlight signals. As such a modern and complex plant i had figured it would be resistant to re-signaling efforts, but again I was wrong. Not sure I'll be able to get back out for "close-up" photos from the adjacent METRA station, but these projects can take a while. 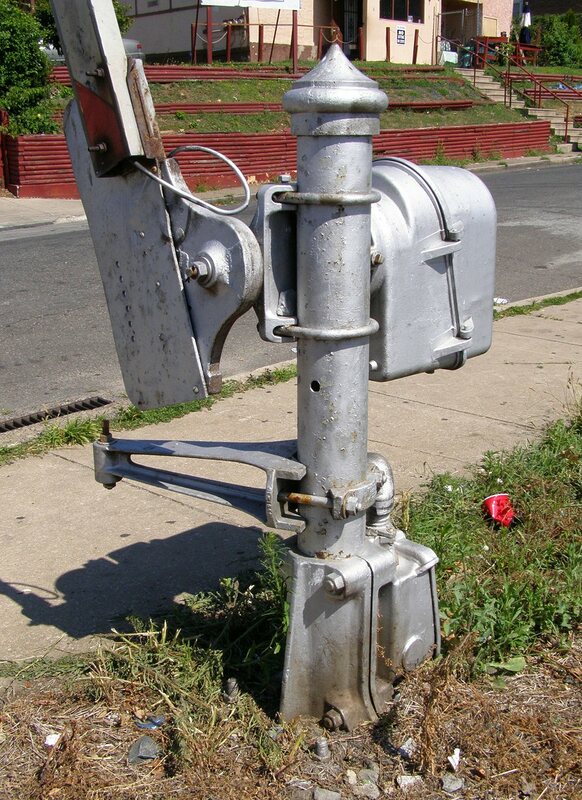 The 5-track double-sided modern searchlight gantries were a true marvel. 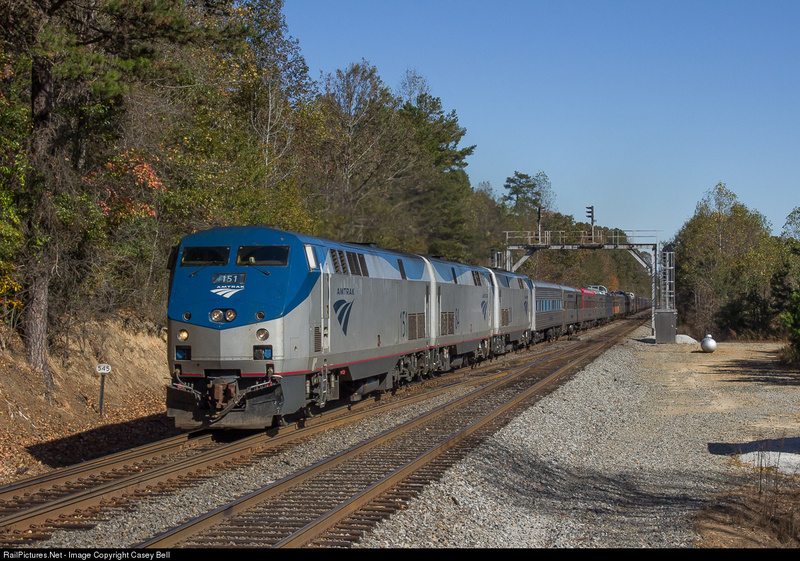 Over the weekend of November 8-9 Amtrak ran its fall Foliage Train on a round trip over the NS Harrisburg Line from Philadelphia to Harrisburg and I was able to use the trip as an opportunity to check up on the state of signaling on the line. For those of you who don't know the majority of the Harrisburg Line comprises the former Reading Railroad Main Line to Reading and then the Lebanon Valley branch to Harrisburg. Although it has seen a fair bit of re-signaling over the years, it still retains a good deal of its original Conrail signaling. Leaving Philly the 1990's era Conrail signals at CP-PARK, CP-BELMONT, CP-RIVER and CP-FALLS are all still in place, but the Reading brackets next to I-76 have been replaced and CP-ROCK has been re-signaled along with some of the ABS signals between there CP-NORRIS. There were still quite a few Conrail style small-target searchlight signals between CP-ROCK and CP-PHOENIX, but nearly all of the ones between there and CP-BIRD have been converted into single direction NS style Darth Vaders. Of course this really isn't news as these signals were installed starting in 2006! Surviving Harrisburg Line small target Searchlight. One major issue with Rule 251 operation emerged when needing to run under a Form D from CP-TITUS to CP-PHOENIX our train was forced to run at Restricted speed for 4 miles because the reverse direction signal only supported Stop and Restricting and with no exit signal we had to travel through the very long CP-PHOENIX and then the block beyond it under a Restricting indication. CP-BIRD has of course long been re-signaled and BIRD tower demolished, however Conrail style US&S NR color lights are still in place between CP-BIRD and CP-TITUS. CP-TITUS, which in Reading days was a flat 2x2 diverging 251 junction still retains much of its original configuration and I believe its original signal logic and pole lines. One special treat is the movable point diamond, a real rarity in North American flat junctions which prefer crossings that can double as crossovers. 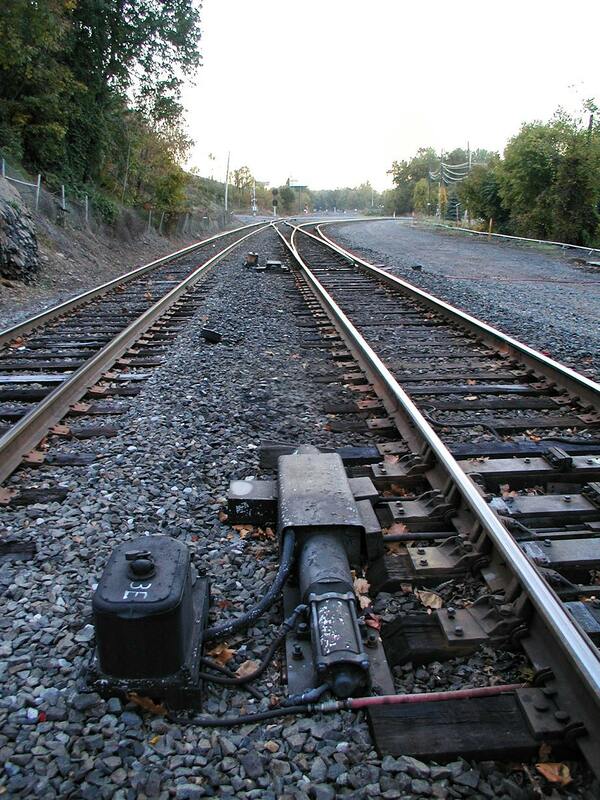 On the other hand, the Reading Belt Line's CP-CRUMU has been completely re-signaled. 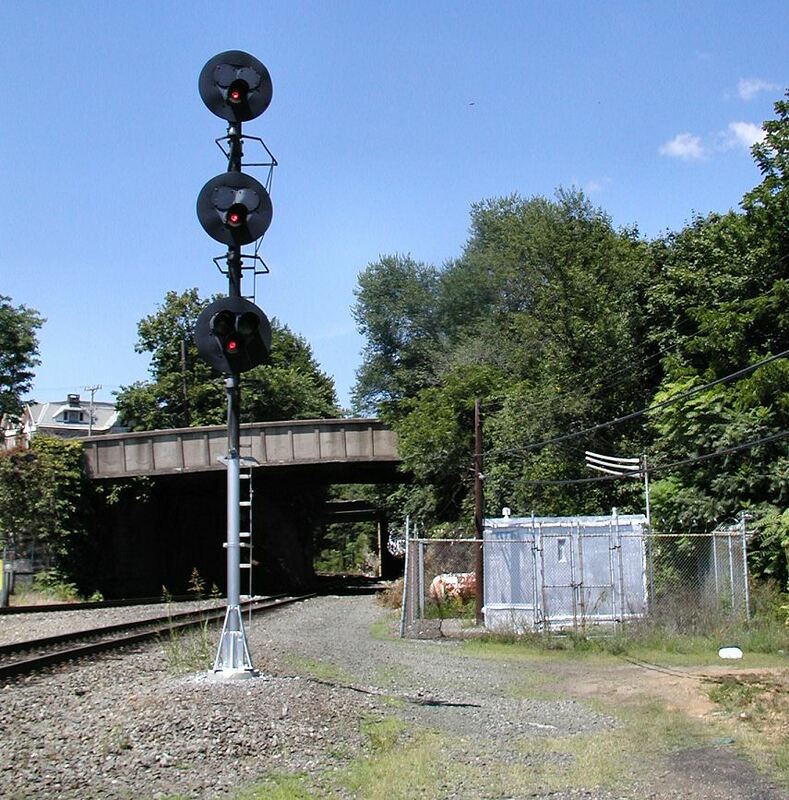 The Reading downtown WYE retains all its Conrail updated Reading signaling including CP-CENTER. Also the line between there and CP-WYOMISSING JCT is still operated under Rule 251. 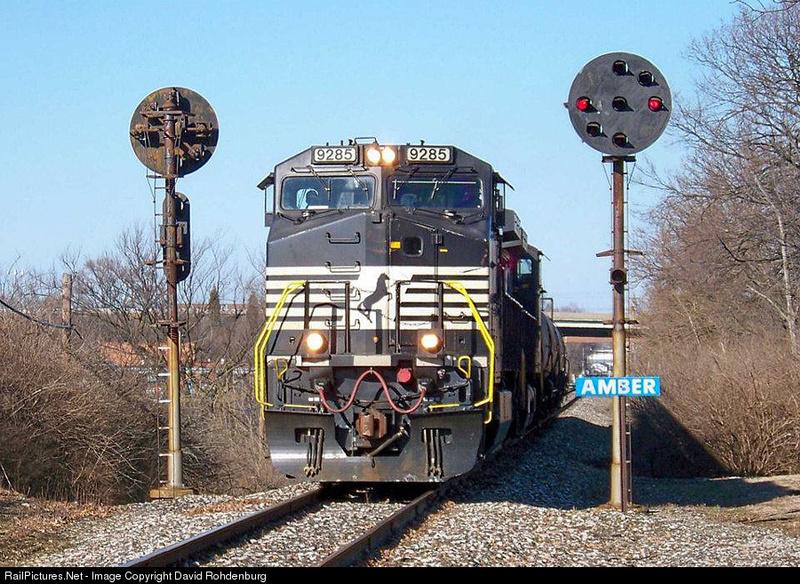 The Harrisburg Line between Reading and Harrisburg was one of NS's first major re-signaling projects right after the Conrail merger and involved replacement of the Rule 251 system with full CTC and crossovers due to the 50+ trains a day that the line sees. 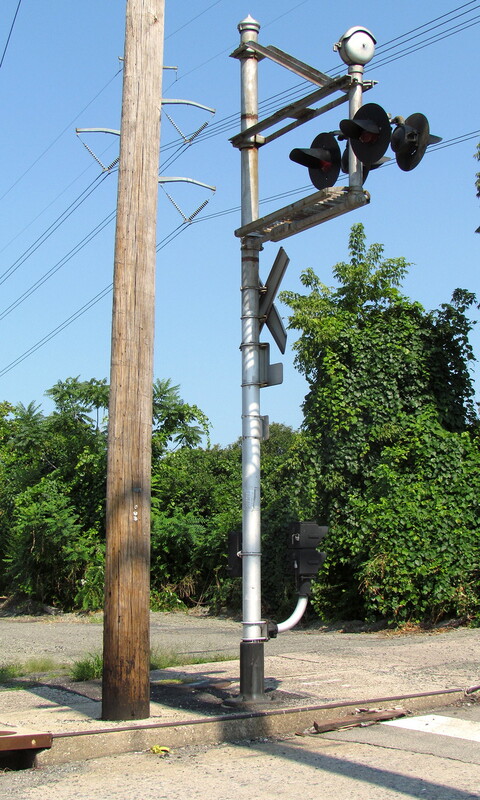 This uses the short-lived NS standard of non-Darth traffic light signals and the special "crankable" signal masts where the heads could be lowered via cable for maintenance. That practice did not catch on and has since been abandoned. The old CP-TARA retains its original Conrail signals, with everything else being NS Vintage. At Harrisburg the Reading vintage CAPITOL tower remains standing. There is a bit of news at the Rockville Bridge wye in that aside from the new Darth Vader mast for the yard lead exit at CP-ROCKVILLE, the pneumatic switches at CP-WYE have recently been converted to electric, I suspect along with CP-HIP across the river. Finally I did have some time to do some recon on the Buffalo Line. Photos showing that CP-SOUTH FERRY had had its signals replaced alarmed me, however I discovered that CP-NORTH FERRY retained its PRR PLs and both end of the MILLER siding not only retained their PL's but had also seen some refurbishment akin to the surviving Port Road signals. 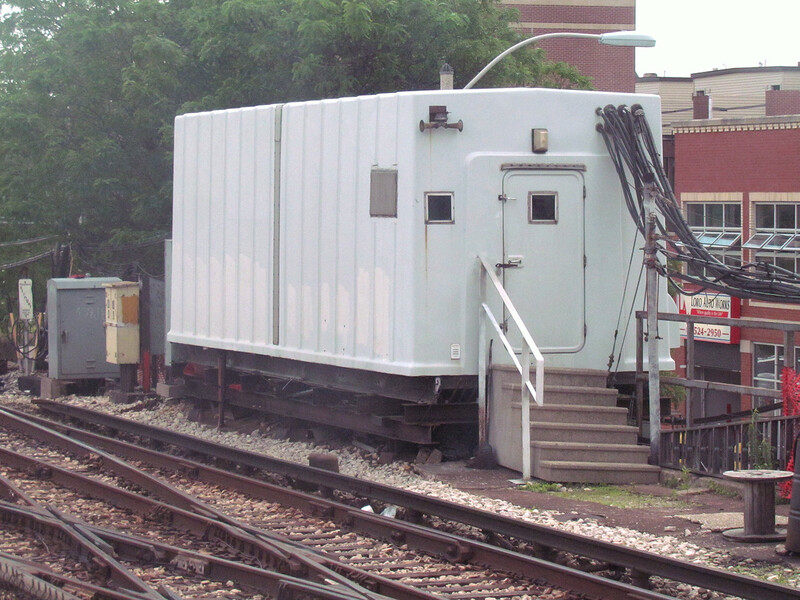 Even CP-SOUTH FERRY retained its original 1950's CTC relay hut and potentially its signaling logic. When railroads retire signals they are typically thrown in the scrap heap, sold off to railfans or sent down to the C&S shoppe to keep any of their surviving kin up and running. For the general public the best they can hope is that a few of the signals will reemerge in someone's back yard or in a static display at a museum. 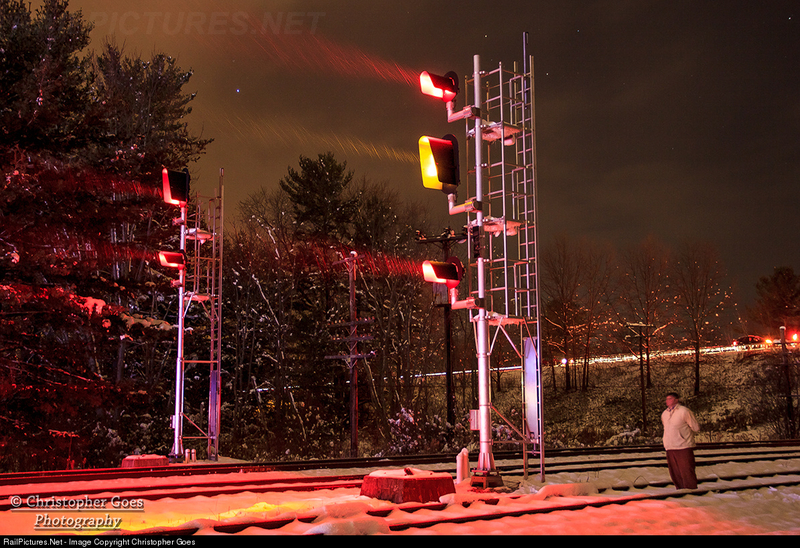 After all, what other use is a railroad signal than railroad signaling? Well...as with everything in life there is a loophole to every rule. 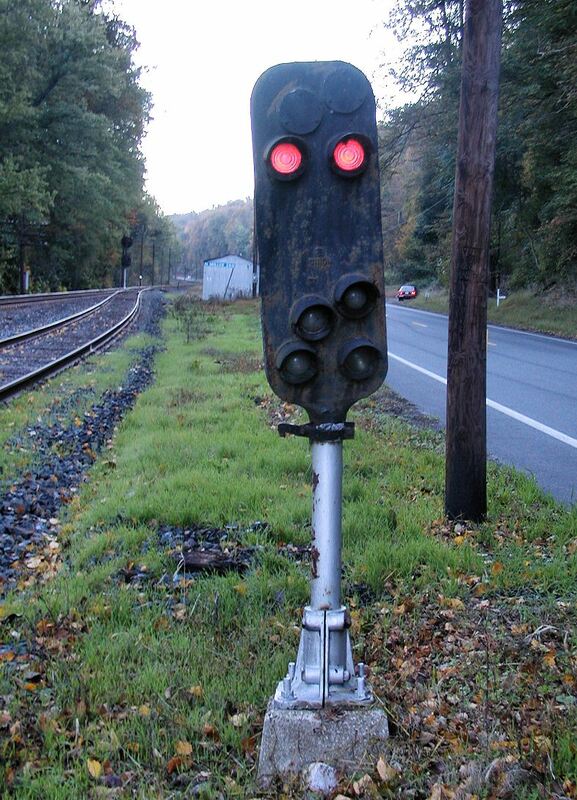 Every so often a railroad will recycle its discarded signaling apparatus until the less vital world of grade crossing warning devices. After all a flashing light is a flashing light. This can give life to signals far beyond their typical sell by date. 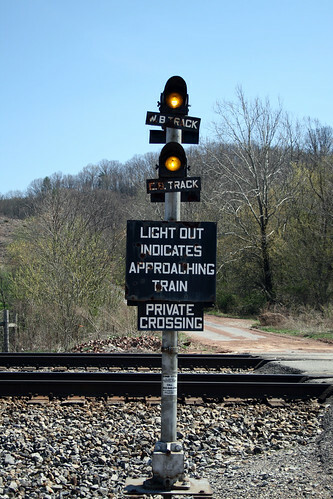 Perhaps one of the more (in)famous examples are track circuit fed warning lamps placed at a number of N&W private crossings in West Virgina. 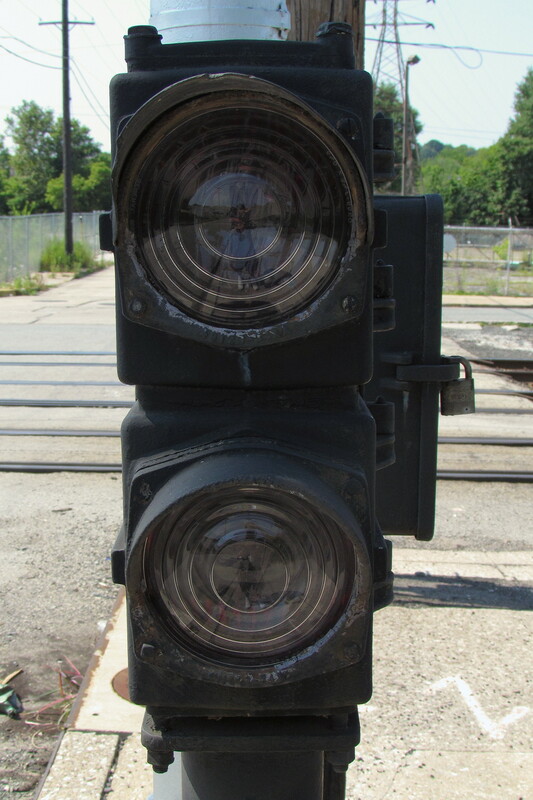 These used surplus N&W amber PL-2 position light signals as track occupancy lights that extinguish when the circuit is shunted by an approaching train in the block. 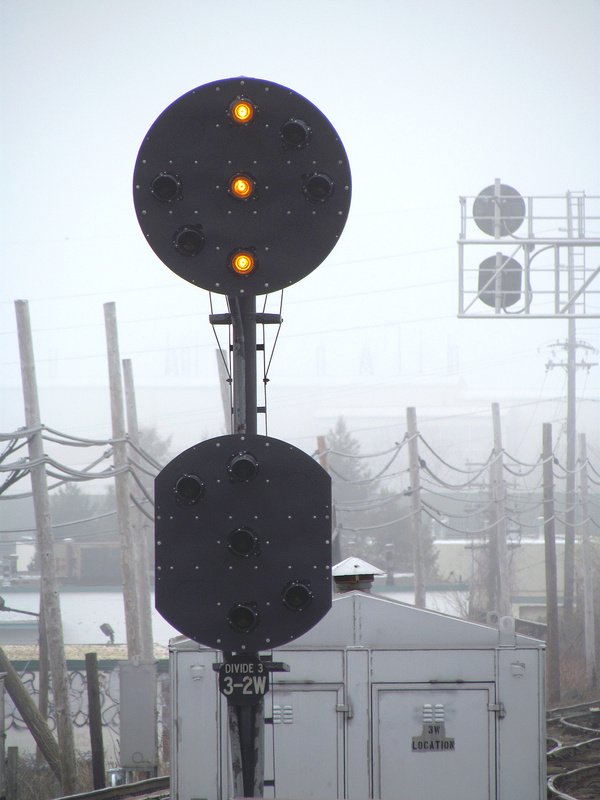 Now I know some of you might be saying that I am cheating as those PL marker lamps may have been installed new, instead of used, but in a related use case the Cape May Seashore Line has employed surplus PL-3 lamps as so called "snitch lights" on its rather unreliable grade crossing equipment as seen in this 2005 photo. Look above the crossing flashers for the amber light. 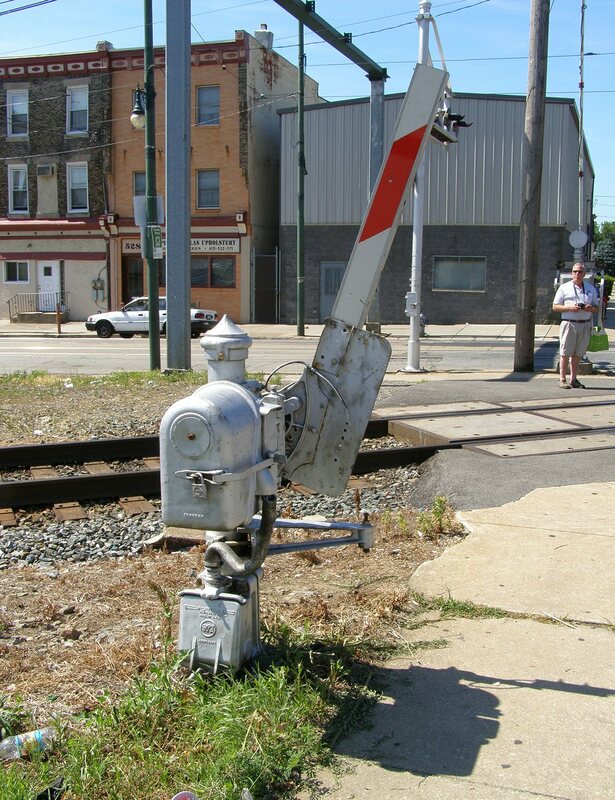 A few months ago I came upon another recycled railroad signal in grade crossing service while documenting SEPTA's FORD interlocking on its Norristown Line. A twin stack of GRS model FA modular drawf signals had been mounted low down on a vintage cantilever flasher mount at the Ford Street (Of course!) grade crossing. The extra pair of flashers had been installed because cars pulled up to the crossing would not be otherwise able to see the flashers above them. 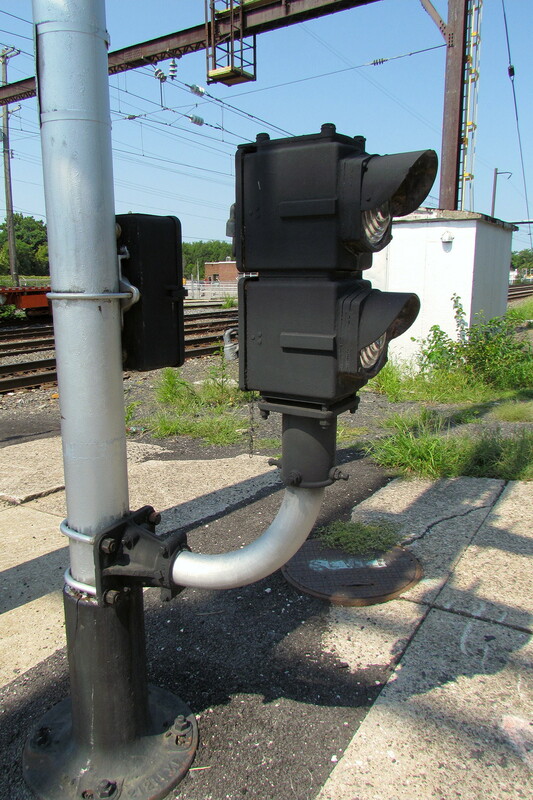 When the signaling department (either SEPTA or Reading) needed this supplemental hardware they went to the recycle bin instead of the PennDoT catalogue. 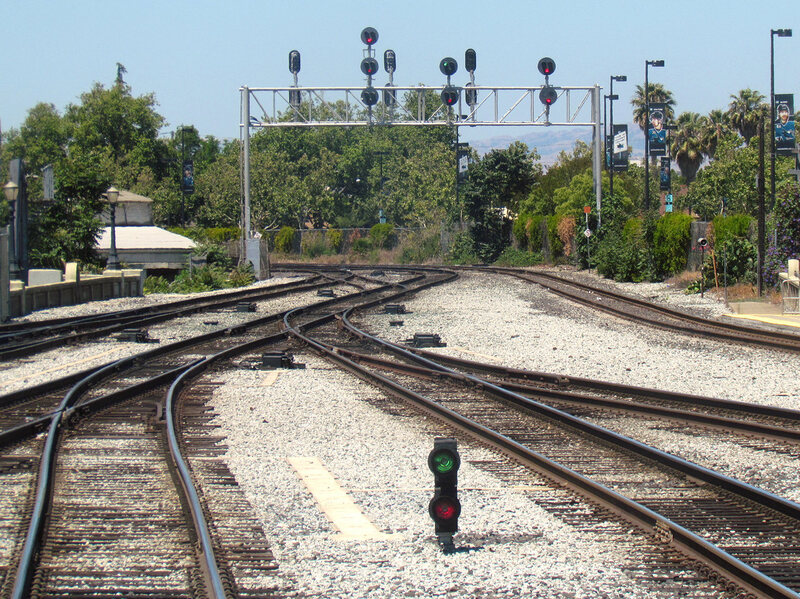 Perhaps the ultimate example of old signals living on in crossing applications is the B&O's reuse of semaphore signals as pedestrian crossing gate mechanisms. 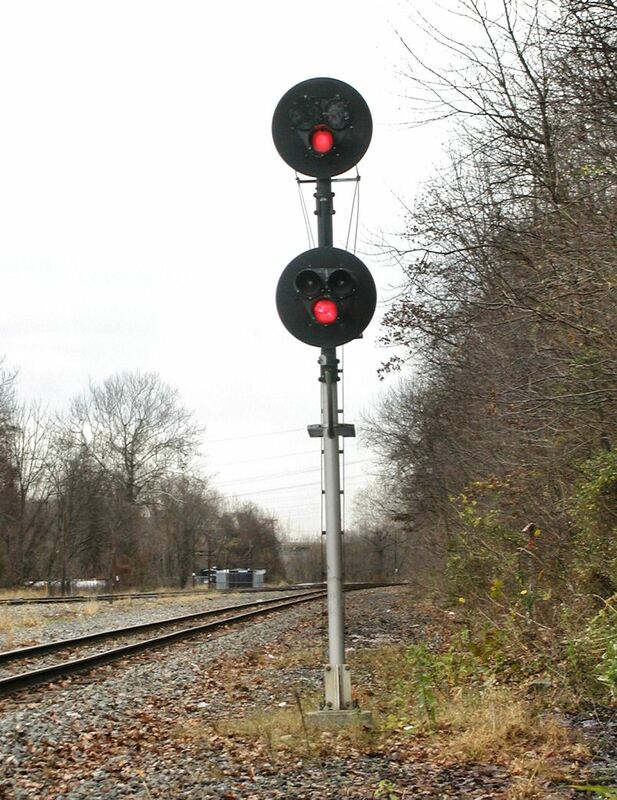 I first noticed this phenomena while passing through Cumberland, MD on Amtrak's Capitol Limited and like the SEPTA signals above I did a double take as I was confronted with railroad signaling in a place I had not expected to see it. Unfortunately the Cumberland examples were replaced before I could get good photos of them (how many times can a signal be replaced? ), but fortunately I know of at least one other example of this type of signal reuse and it is transit accessible! 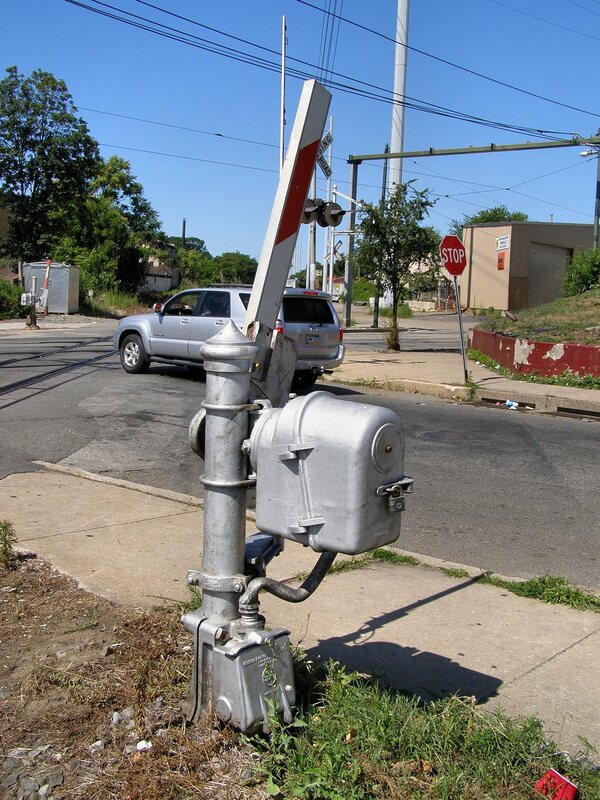 At the famous SEPTA Route 11 - CSX Philly Sub grade crossing, a pair of former B&O semaphores stand guard on the sidewalks stopping cyclists and pedestrians from crossing the tracks. I wasn't joking. 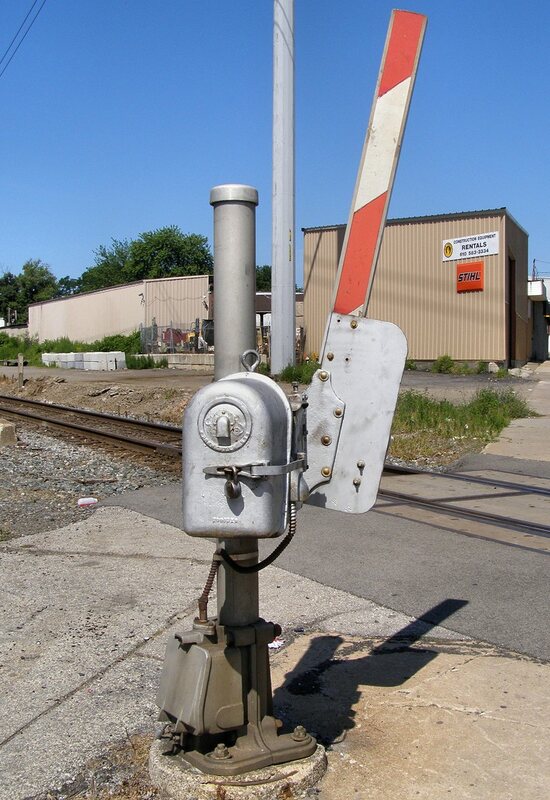 The B&O (or Chessie System) literally replaced the semaphore blade with a red and white striped crossing gate and put it into service. These are 90% as "good" as a in service signaling semaphore. The train approaches the semaphore drops, the train leaves it goes back up again. All that's missing is the / position so just pretend you're in manual block territory. 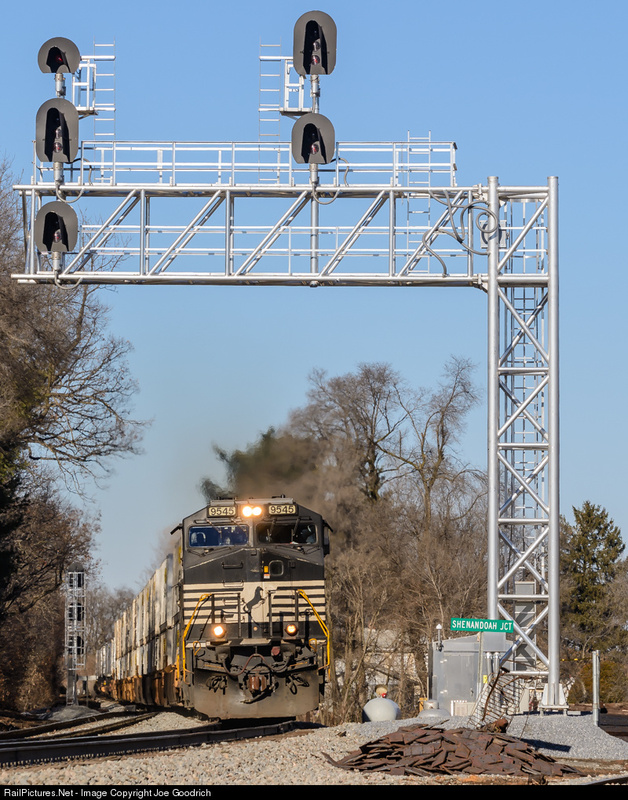 Combine the semaphore crossing gates with old school cantilever flasher masts, frequent trolleys rumbling over an active railroad main line and a nearby B&O CPL signaled interlocking and you have perhaps the most interesting level crossing in the country. 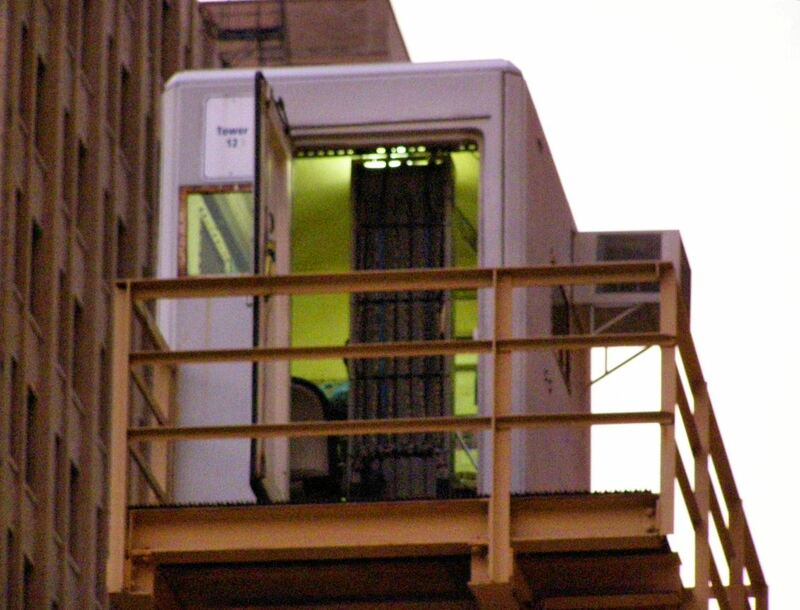 The Chicago Transit Authority has remained a strong supporter of the "tower" system of rail transportation control. Just like the NYC Subway and the Long Island Rail Road, the CTA's traffic density still gives an edge to human eyes and judgement in place of automated routing and remote control. 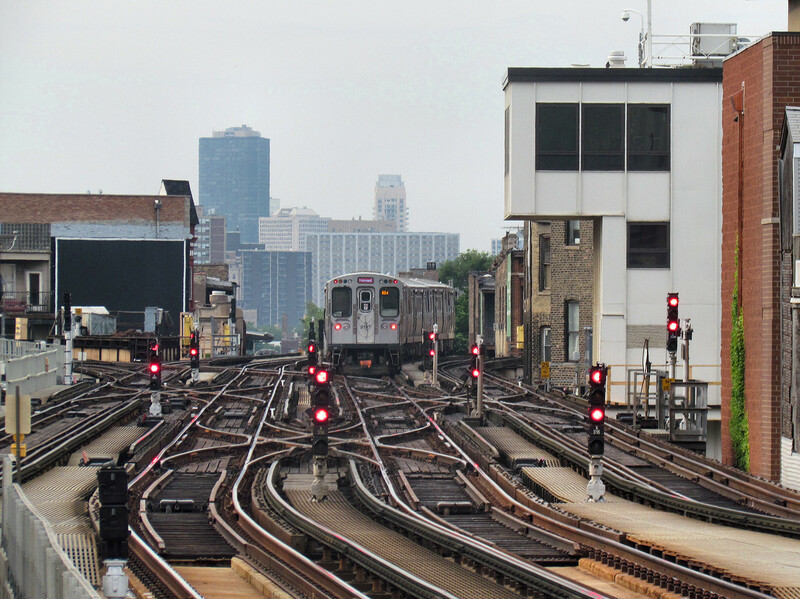 Those who ride the CTA are probably aware of the currently manned towers placed at the yards and major junctions. It is pretty hard to miss them the way the operator's cabs typically cantilever out over the tracks. The CTA even produced this video showing its recently rehabilitated towers at TOWER 18 and CLARK JCT, which received brand new NX Panels. However the CTA has another type of tower, one that is almost ubiquitous, but also hard to spot. While local control panels are a common feature in most relay rooms, the CTA steps things up one notch by placing many of these, from junctions to simple crossovers, in their own little booths. The most "tower" like of these mini-towers is TOWER 12 at the southeast corner of the loop where Orange and Green line trains split off to the south. While this junction is normally remote to Tower 18, there is still a small porta-potty sized booth where a human operator takes over at peak periods. 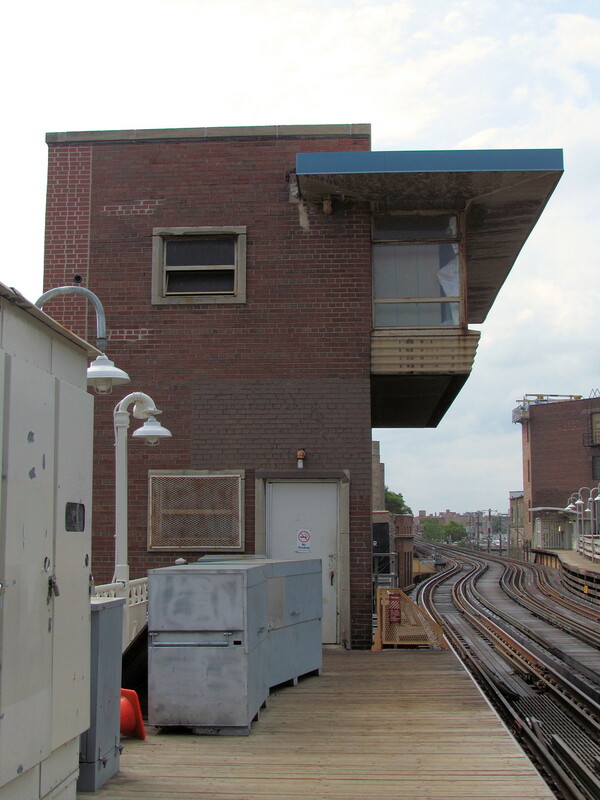 Another form of the CTA "mini-tower" is a space built right into the trackside relay huts. 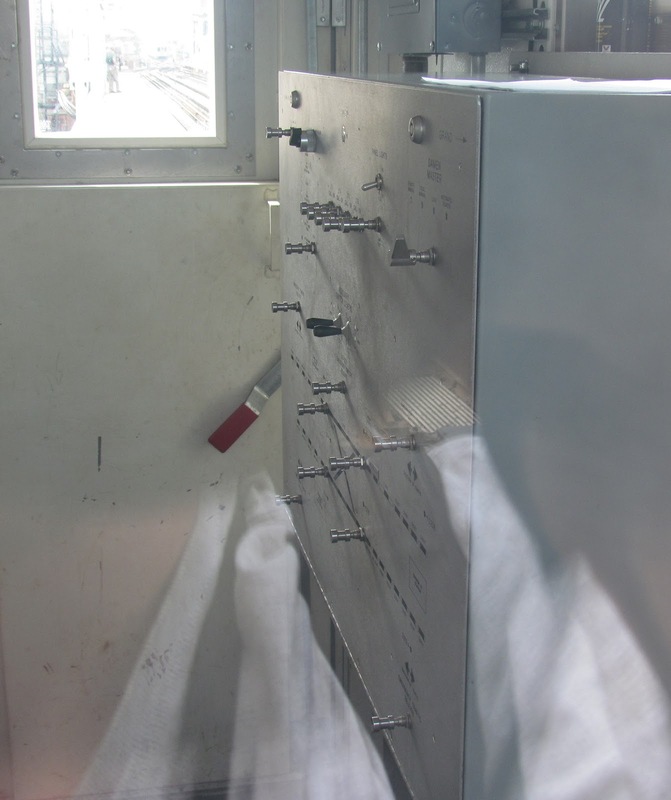 Again the giveaway are the windows placed in a manner that would allow an operator full view of arriving trains. 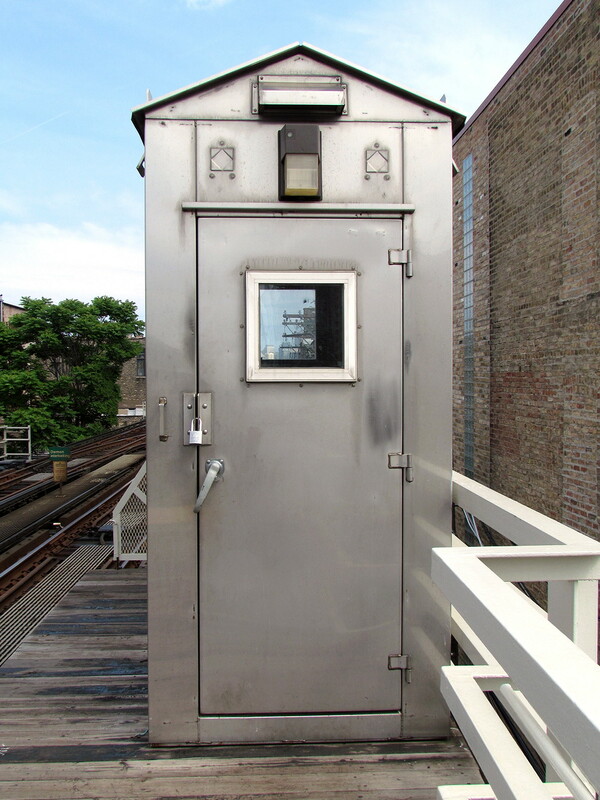 Here is a portable interlocking cabin set up at the Harlem and Lake Green Line terminal and again the small window for manned operation is present (also note the interlocking horn). 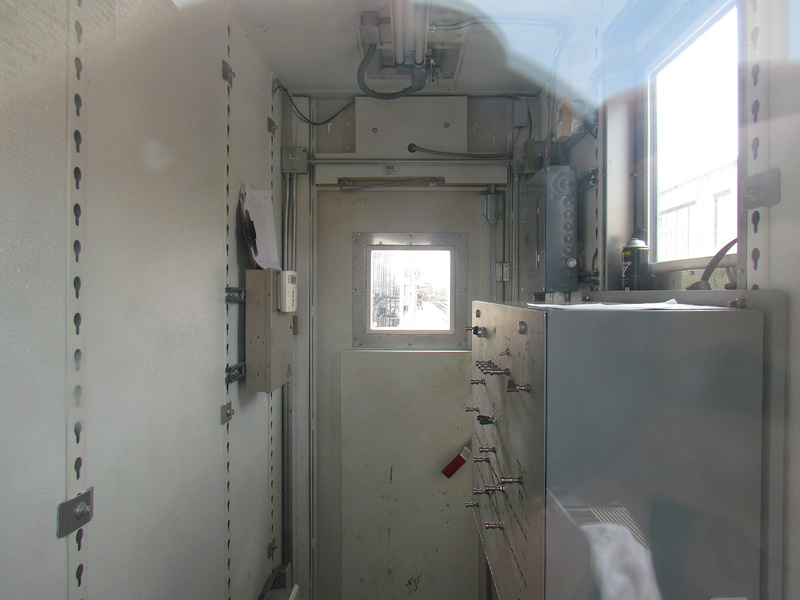 Finally, sometimes the operator can get his own stand-alone booth on the station platform. 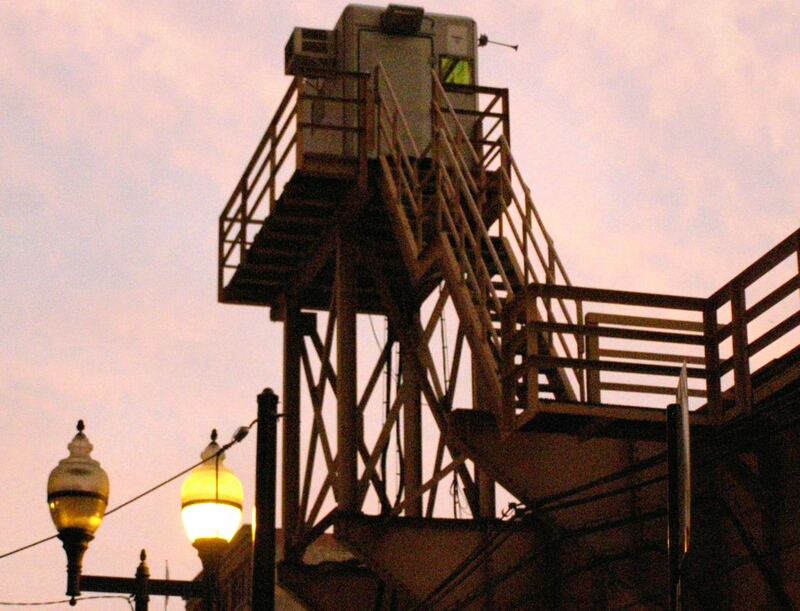 One such mini-tower is located at the south end of the Damien Blue Line platform. This mini-tower controls a small scissors crossover immediately behind it. The interlocking is clearly remote from somewhere else, but as you can see the Damien local tower has a fully functional panel. It has NX buttons for the signals as well as overrides to throw the switches without a signaled route. It also has buttons for the direction of traffic on all four exits, call-on buttons and even a button to sound the interlocking horn. Of course there are switches to set control local, remote or automatic.